Joe Cocker, whose distinctive raspy voice and soulful musical renditions made him a favorite of his peers with hits like Beatles' cover “With a Little Help from My Friends” and “You Are So Beautiful,” died on Monday. He was 70. The British rock singer, famous for flailing his arms during performances, lost a long battle with lung cancer, said his label, Sony Music Entertainment, in a statement. 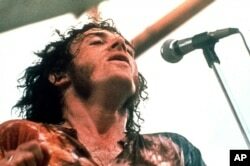 The Sheffield-born Cocker's rocky but ultimately successful career took him from working-class pubs in Northern England to the Woodstock festival in 1969, to the top of the charts in the 1980s. Former Beatle Paul McCartney credited Cocker for giving “With a Little Help from My Friends,” a mid-tempo melody, a whole new life. FILE - Joe Cocker performs at Woodstock in Bethel, New York, August 1969. Cocker lived in Crawford, Colorado, and released nearly 40 albums as he toured the world during a career spanning five decades. The Grammy winner was born into a working-class family and worked as a plumber while pursuing his singing career. He was named an Officer of the Order of the British Empire (OBE) at Buckingham Palace in 2011. “Goodbye and God Bless to Joe Cocker from one of his friends peace and love. R.,” tweeted Beatles drummer Ringo Starr. In the early 1970s Cocker's “Mad Dogs and Englishmen” tour and live album cemented his success. In 1974, “You Are So Beautiful,” co-written with Billy Preston, was a big hit. It was voted the fourth-most popular love song in a U.S. online poll in 2013. Cocker's career path was punctuated by struggles with alcohol and drugs. In 1982, his career took off again with “Up Where We Belong,” a duet with Jennifer Warnes for the film “An Officer and A Gentleman.” The song earned Cocker his only Grammy and an Oscar for its writers. His last studio album “Fire It Up” came out in 2012. Cocker is survived by wife Pam, brother Victor, a stepdaughter and two grandchildren. He and his wife set up the Cocker Kids' Foundation to support local Colorado youth.